Set in ancient Persia. While the sultan is fighting a war in a foreign land, his vizier Jaffar, a wizard, seizes power. Jaffar's only obstacle to the throne is the Sultan's daughter. Jaffar locks her in a tower and orders her, under threat of execution, to become his wife. The game's nameless protagonist, whom the Princess loves, is thrown into the palace dungeons. He must escape the dungeons and go to the palace tower, defeating Jaffar and freeing the Princess in under 60 minutes. 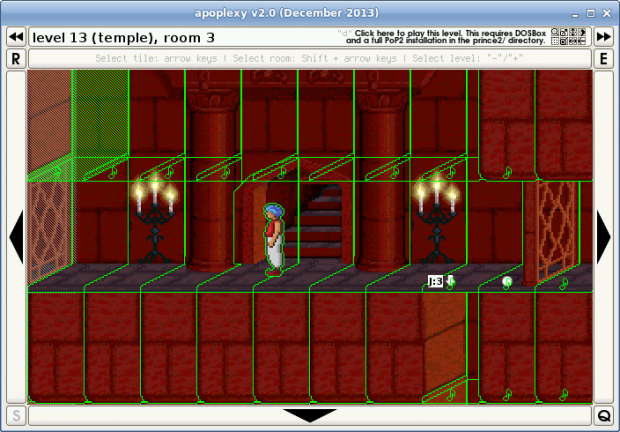 Version 2.0 of apoplexy has been released! The free and open-source level editor of Prince of Persia for DOS now also has full support for editing Prince of Persia 2 levels.